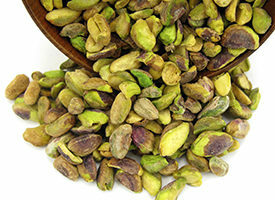 Pistachios and other nuts are a mainstay of the healthy Mediterranean diet. Studies link this diet to some of the highest life expectancy and lowest heart disease rates in the world. You don’t have to eat a lot of pistachios to reap the benefits. But beware! Their buttery, rich flavor makes them easy to over-indulge in. The right serving size to aim for is one to one-and-a-half ounces a day. That’s about a handful. There’s about 49 pistachios to the ounce. Pistachios can make a great snack, as long as you don’t pig out on them. One trick to avoid eating too many is to buy them in the shells. They’ll take a little longer to eat because you’ll have to pry open the shells. The shells also are a great visual reminder of how many you’ve eaten. This can help to keep you on track with portion size. One easy way to incorporate pistachios into your daily diet is to use them as a garnish. Use them to top off a healthy stir-fry, soup or salad. They have nutrients such as vitamin B6, which promotes blood flow by helping to carry oxygen through the bloodstream to cells. Vitamin B6 also promotes immune and nervous system health. They have plant-based compounds that act as antioxidants, including vitamin E, polyphenols and the carotenoids lutein and zeaxanthin. Two of these antioxidants, not found in other nuts, have been linked to a decrease in the risk of developing macular degeneration. They support healthy cholesterol levels. 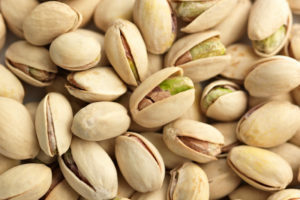 Pistachios have 13 grams of fat per serving, the majority of which (11.5 grams) comes from heart-healthy monounsaturated and polyunsaturated fats. Studies have shown that adding pistachios to a healthy diet may help to lower levels of oxidized-LDL (bad) cholesterol This is because of the nut’s high level of monounsaturated fat, which has been shown to reduce the levels of LDL cholesterol.